There is nothing sadder than seeing a career by a highly respected and obviously influential musician go virtually unnoticed because he was not recorded often or adequately. Such was the fate of Frank Hewitt, born in New York in 1935 and died there in 2002, a victim of cancer, a few weeks before his 67th birthday. 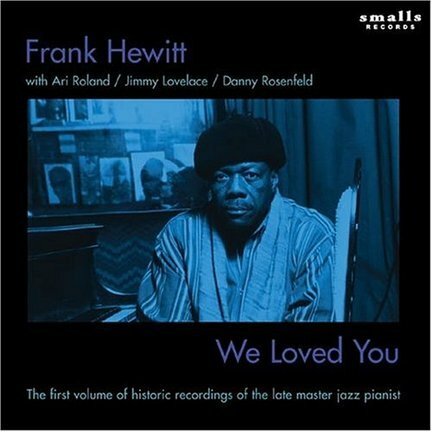 The Smalls label (named for the club where Hewitt played regularly a few nights each week for nine years) has released We Loved You, promising it will be “the first volume of historic recordings of the late master jazz pianist.” Here’s hoping future issues will include live recordings, if they exist. The probable excitement of those nightly sessions are needed to dispel the unevenness of the two studio sessions here, neither of which does justice to Ari Roland, a bassist who contributes some fine arco solos (which you can’t hear very well) or the drummers for each session, Jimmy Lovelace and Danny Rosenfeld, respectively. Hewitt was a strong bop pianist who did everything first take, unannounced, letting his poetic intros do the talking.